Israel closes Kerem Shalom crossing, won't extend expansion of Gaza fishing zone. Israeli Prime Minister Binyamin Netanyahu and Defense Minister Avigdor Liberman (Yisrael Beytenu) on Monday accepted the suggestion of IDF Chief of Staff Gadi Eizenkot to close the Kerem Shalom crossing between Gaza and Israel. The closure will not apply to humanitarian aid, including food and medicine, approved on an individual basis by Coordinator of Government Activities in the Territories Kamil Abu Rokon. 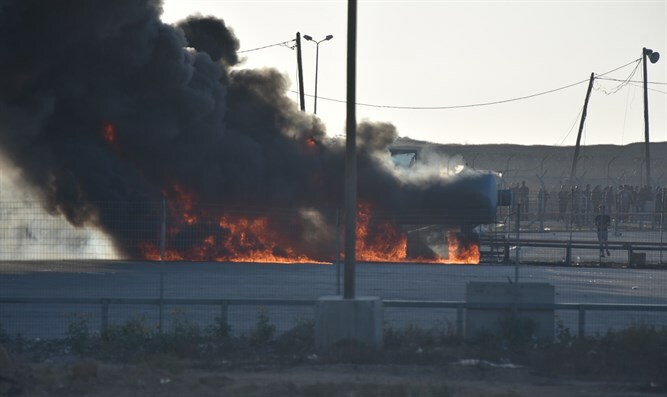 The decision comes in response to continued arson terror perpetrated by Gazan terrorists via incendiary kites and balloons sent from Gaza into Israeli territory, as well as other attempts at terror attacks. In addition to the closure of Kerem Shalom, the decision was made not to allow the expansion of the fishing zone around Gaza to continue throughout the duration of the season. The fishing zone is usually six naval miles wide, but was temporarily expanded to nine naval miles three months ago. The IDF clarified that the time period for the expanded fishing zone ends on Monday, and it will not be extended. In a statement, the IDF said, "The State of Israel aspires and acts to improve the humanitarian reality in the Gaza Strip in many ways. However, in light of the situation in which the Hamas terror organization exploits the Gazan residents and launches arson and explosive balloons and kites towards the communities adjacent to the Gaza Strip, Israel decided to take these measures. The current situation does not allow the residents of southern Israel to maintain their daily routine." "Should these severe conditions continue, Israeli measures will persist and intensify. "The Hamas terror organization is accountable for the activities in the Gaza Strip and their consequences. The Hamas terror organization is the one who is dragging the residents of the Gaza Strip into an abyss, and the IDF will continue to operate as necessary to safeguard the security needs of the State of Israel." Earlier today, Netanyahu announced the closure of Kerem Shalom, and emphasized that from today on, Israel will "deal with Hamas with a heavier hand."